Too many choices? Need help? then click here. What range of devil sticks do we have? At Home of Poi we have a wide range of devil sticks for sale. Available are fire, LED, Practice tapered and flower devil sticks. Can I purchase just a devil stick? Yes we do have single devil sticks available in some of the range if you already have handsticks available. Do you sell parts for devil sticks? Home of Poi sell the handsticks made from strong hollow fibre glass and grippy silicone as well as wicks for replacing fire devil stick wicks. What is the best devil sticks for a beginner? For a beginner we would always recommend a flower devil stick. The flowers on the end of the sticks slow down the movements making it easier to new new moves and tricks. They also look amazing while spinning. Please remember when using fire to think safety first and also read safety instructions and lessons before lighting your devils ticks. "Sticks had plenty of grip; perfect for a beginner like myself. Ordering online was made simple and easy, which along side rapid delivery made me super stoked!" "I am happy to deal with Home of Poi and am always surprised by the prompt delivery of equipment that I have ordered." "Ordered as a Christmas present, arrived on time and recipient is very happy with product." "Got Devil stick for Christmas. It's a good work out learning to use them"
"Weighted perfectly and the sillicone sticks like nothing else, great for juggling and contact flow 10/10"
"Home of Poi is provides an easy fulfillment and ordering platform for high quality products. 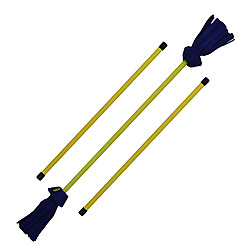 These devil sticks have great traction, feel durable, and are very responsive. I have only ever owned flower sticks purchased at a renaissance fair around a decade ago and believe these are significantly better. Fire safety resources are a must and I am excited to continue practicing until I feel ready to take that next leap." "Have not played with them since I was like 9 and I am 40 now but I feel like I'm 9 again kinda thang. Thanks"
"These were my first juggling sticks and I absolutely love them. I found them very easy to learn and progress quickly, with everything about the grip, weight, and looks being perfect for me. The silicone grips very well and the sticks are also very durable as i drop them a lot pretty hard and there is no noticeable damage! Highly recommend!" "Since I start to play with the Devil Stick, this one that I bought in HOME OF POI are the bests ones. The tricks are easy to made, the balance is perfect. I really recomend this for everyone who wants to learn and also for who already know how to play." "Good quality set and heaps of fun to learn and play with." "I am very pleased with the flower sticks. They arrived really fast and the quality is very good. Especially for me as a beginner they enable me to learn faster since the silicone helps with the grip. Good product and good service"
"I was able to get a well balanced medium weight taper, and some extra sticks w/ the black and white color combo i wanted and the nailed it. My style started with light flower sticks, so i tend to have slower more rhythmic tricks, all around a perfect combo of a slightly lighter tapered balance stick with a strong holding tape+sticks." "I have ordered from here around five times and always love the products. I don't mind the time it takes to be shipped to the US bc I know it will always show up well made and in perfect condition." "these are top sticks - really well made, study and excellent to use I run workshops for children so they need to strong and durable cheers and thanks"
"The devilsticks I purchased I still use everyday. The grip is weak now.. But nothing lasts forever. Plus I have been rough on the sticks. They still balance perfectly"
"Good quality sticks. I m confident they ll last me years to come. Would buy again." "I haven't had any devil sticks for year. I was so happy to find these. Great quality for the price." "The first pair of my sticks broke within a few weeks. I contacted Home of Poi and they replaced them without a problem. So far these new sticks have worked and lasted great." "Amazingly beautiful and dynamic set of Flower/Devil Sticks... My daughter loves them!" "thanx i got my devil sticks real fast and i love them i cant put them down im used to the crystal sticks but im learning how to use the fire sticks pretty quick and if im not useing them i have a friend that does so they are always in use when were not working thanx again"